2012 Summer Promos ~ Philippine Freebies, Promos, Contests and MORE! It's time to take a break and enjoy the season with these three exciting 2012 summer promos. The Love Shop ForMe raffle is very easy. 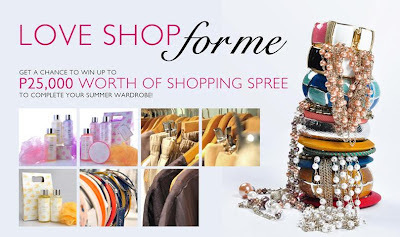 All you need to do is spend at least P1,000 at ForMe boutique, like their FB fanpage, fill out and submit the promo form on the Love Shop ForMe app and invite others to join. As simple as that for a chance of winning P25,000 worth of shopping spree. 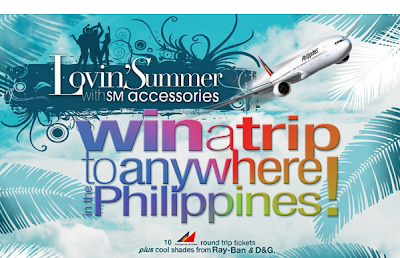 On the same fashion note, for only P200 spend at SM Accessories, you can win two (2) round trip tickets to anywhere in the Philippines in the Lovin' Summer with SM Accessories promo. Log on and register at their FB fanpage, choose your category and upload your photo wearing the purchased accessories. The more gathered votes, the better chances of winning. And lastly, get sporty with Aloha Boardsports' Surf Bound: Bali promo. Shop at any Billabong and Aloha Boardsports and make a minimum spend of P2,500 on their participating brands to get a raffle stub. 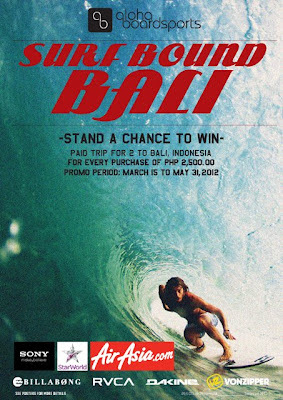 This will be your ticket to win a trip for two (2) to Bali, Indonesia inclusive of round-trip tickets, accommodations and gifts from sponsors. 20% tax of prizes exceeding P10,000 shall be shouldered by Freesurf, Inc.